Ah, the life of young startups is exciting isn’t it? Pivots. Ramen. Courting investors. A year ago, we covered a fledgling startup called numberFire that is attempting to bring a deep, scientific approach to your fantasy football picks. Not long before our initial coverage, numberFire Founder and CEO Nik Bonaddio won $100,000 from Regis Philbin on the one-and-only “Who Wants To Be A Millionaire”. (Check out Nik’s performance here.) Now, Bonaddio could have taken that money and gone in on a timeshare in Aspen or a one-way ticket to the Caribbean. But, being the pirate that he is, Bonaddio made the bold decision to sink that game show moola right into his startup. What’s more, the startup is currently in the midst of raising a seed round from some top New York investors (we’re hearing that the round will be a touch under $1 million). When numberFire first launched in beta last September, there were still quite a few kinks to work out, and the site wasn’t yet ready for the big time. But a year later, numberFire has come a long way, and for football fans, numberFire is getting close to to being last tool you’ll ever need for your fantasy football picks. Fine, but what exactly does the startup do, you ask? In tandem with broader trends we’re seeing across the consumer web, numberFire is tapping into the ever-more popular content personalization game — by allowing users to customize their football updates, following teams and players that they are interested in — both as fans or as fantasy gamers. NumberFire curates several activity feeds that present the user with the latest activity around their favorite players (like news, updated projections, etc.) that keep them up-to-date and engaged. Bonaddio is himself a diehard Steelers fan, and so the idea for numberFire came from the simple need to both keep up with his team and give he and his friends a leg up in their fantasy seasons. 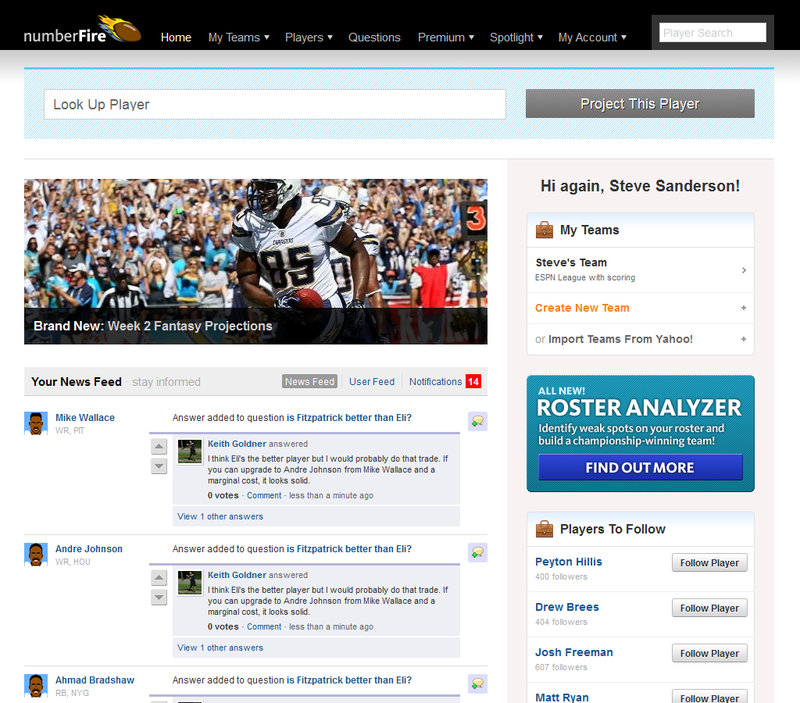 As more than 20 million people play fantasy football every year, the founder is not alone. Bonaddio set out to create custom, proprietary algorithms that will do all the stat-crunching for you, allowing users to easily import their existing teams from Yahoo or ESPN’s fantasy websites, and quickly get started. But what truly sets numberFire apart is its “cumulative” approach to making projections. In projecting whether or not Eli Manning will fare well this weekend, for example, numberFire might compare Manning’s stats to quarterbacks playing today as well as those that played years ago. The idea is to match Manning’s physical characteristics to others, as well as taking into consideration what particular fields he performs well on, at what times of day, in what conditions, etc. numberFire also takes the Giants’ collective offense into account, what types of plays they run, whether they have a strong running game, and so on, in an effort to decipher whether or not next week’s game at Philadelphia will be a good matchup for Manning (and, by extension, the Giants). But, beyond this holistic approach and its top-down analytics features, numberFire also allows users to crowdsource their decisions and engage other users in conversation through a “Q&A” feature, which capitalizes on a trend started by Quora and StackOverflow. Neither site targets sports fans (or really time-critical questions), so numberFire wants users to take advantage of its Q&A section to receive insight from a community of like-minded individuals. The questions, answers, and ensuing comments all pop up in a user’s curated newsfeed around the players and teams they’re following. Pretty cool. Of course, for a young startup growing a business in the consumer web, it’s all about acquiring and retaining users. numberFire met with some problems early on in this area (like so many before it), so to address this problem, the team has struck partnerships with SB Nation, BleacherReport, CineSport, and other sports media companies to reach a broader audience than it would be able to capture on its own. The startup accomplishes this by offering the ability to embed its data widgets into third-party sites and by delivering video content developed by its team. With these strategic partnerships, a soon-to-close round of seed funding, and Entrepreneurs Round Table demo day fast-approaching, numberFire has come a long way in the last year, and I’d say is offering a great value proposition for fantasy football enthusiasts and regular old sports fans alike. Now, if numberFire can just quickly expand to baseball so that I can finally make some money on the Red Sox, then we’ll really have something going.